Tons of really cool stuff has been invented in garages, like Apple computers, Wham-O toys and your 10th grade punk band, which would've made it big if only you guys weren't so distracted by Wham-O toys. Inventing the coolest of all cools (beer) from their rented SOMA garage, the Clara Street Brewing Collective. Founded by two floppy-haired dudes with five-plus years of home brew experience, but sadly no beer guts, the CSBC's essentially a chem lab for hop juice that secretly opens to the public every other Thursday for gratis tastings; centered around an awe-inspiring two-keg beer-making contraption, the garage is littered with 100-pound bags of grains n' grasses, ominous jugs of fermenting ales and everything you'd need for an epic house party, except Kid N Play and the requisite well choreographed dance off. 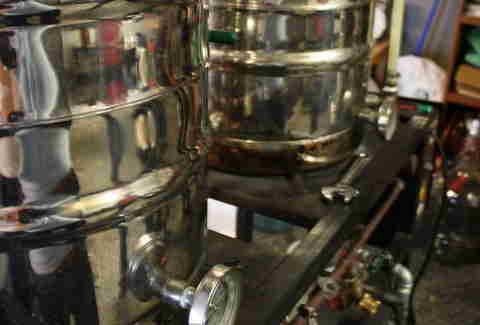 The beer-making process starts at a "Brew Magic" machine they purchased on Craiglist, where a 15-gallon polished stainless steel keg heats the beer-gredients to 220 degrees, before being hooked up to 'The Beast'-an eight-armed high-performance heat exchanger that brings the beer down to 68 degrees -- and then finally, they add yeast and stick the mixture into a fermenting jug for 7-14 days before enjoying it on said Thursdays with 30-40 neighbors, friends, and friends-of-friends-of-friends-of-friends, which is invariably Kevin Bacon. 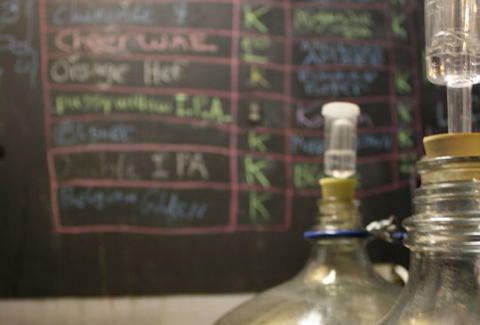 A wall-sized chalk board acts as a jumbo excel spreadsheet to keep track of what's still fermenting, what's ready to be kegged, and what's on tap in their triple-kegerator, which has recently cooled a monstrous 10-percent Double IPA, a robust Chamomile Pale Ale, and a light and refreshing Hibiscus ale that's actually a dark pink hue, but not a dark pink Hugh 'cause that dude wears 45. The pair's on-tap goodness has been so good, they've been asked to do weddings, underground butcher events and a few fundraisers in the past year and plan to open a brew pub in SOMA once they find a space, finalize the recipes, and figure out a name, though it'll never be cooler than Chet & The Awesome Guys.